I love that I now have memories of Caleb from a year ago. I often think 'this time last year we were doing this...', but it is also nice that the things he's experienced before are still completely new to him. This spring he'll really notice the birds singing, the leaves on the trees, the flowers blossoming... he'll love being outside without layers of clothing, swimming in lakes and bonfires on our front yard. It is Caleb's second Spring, but it will bring all firsts for him. 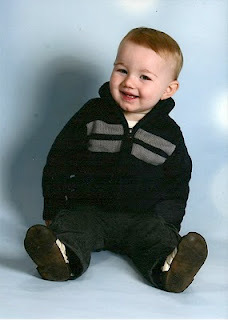 Caleb's one year photo just came in from Sears. Such a handsome little guy. I've got some very happy news to share. Arlo has found a new, wonderful home. A loving family with teenage kids, a huge fenced in yard AND another beagle! He is apparently very happy in his new home and his new owners couldn't love him more. I feel such relief and satisfaction knowing that he is now bonding with a new family in a stress free environment and it makes me really happy to picture him chasing his beagle sister around the yard. Adorable picture of Caleb, and great news about Arlo. I check often for your new blog posts!